Japanese Prime Minister Shinzo Abe, center, shakes hands with European Council President Donald Tusk next to European Commission President Jean-Claude Juncker, right, before a meeting at Abe's official residence in Tokyo (July 17, 2018). Their new FTA is “of enormous strategic importance for the rules-based international order,” says the European Council president. The signing of the European Union’s biggest ever bilateral trade deal shines as “a light in the increasing darkness of international politics” at a time when some are questioning the rules-based international order, according to European Council President Donald Tusk. Tusk and European Commission President Jean-Claude Juncker raised concerns over the rise of protectionism when they traveled to Tokyo to meet with Japanese Prime Minister Shinzo Abe and sign a long-awaited Economic Partnership Agreement (EPA) with Japan on July 17. The EPA, which has been under negotiation since 2013, is set to create a free trade zone that covers 600 million people and nearly a third of global GDP. Negotiations concluded last year but with the formal signing paves the way for the deal to come into force early next year. For Abe, it represents another visible win on a trade pact, coming soon after Japanese leadership helped revive the Trans-Pacific Partnership (TPP) following U.S. President Donald Trump’s decision to pull the United States out of the Pacific rim-focused trade agreement. Japan recently formally announced it had completed domestic procedures for the so-called TPP-11 (officially known as the Comprehensive and Progressive Agreement for Trans-Pacific Partnership) and hopes other signatories will follow suit soon. Abe has had to recalibrate his approach in light of Trump’s trade policies: the possibility of the United States introducing new tariffs on auto imports is a serious concern to Japan. Tokyo had previously lobbied – unsuccessfully – for exemptions to the steel and aluminum duties announced earlier by the Trump administration. Trump has repeatedly complained about Japan’s trade surplus with the United States and called for talks on a bilateral trade agreement between the two countries. Tusk and Juncker, meanwhile, implicitly criticized Trump’s disruptive approach to world trade. “This is an act of enormous strategic importance for the rules-based international order at a time when some are questioning this order,” Tusk told reporters. He said the deal aimed to send “a clear message that we stand together against protectionism.” Tusk further argued that the deal was a sign that “you can count on us” and that both Japan and the EU were “predictable, responsible” defenders of a rules-based world order. 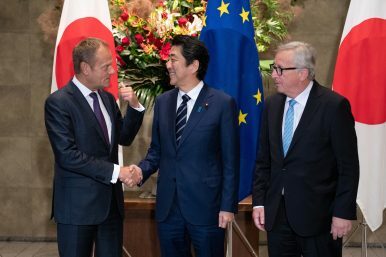 In their joint written statement after the Japan-EU summit, Abe, Tusk and Juncker agreed that further work was needed to protect intellectual property rights and market-distorting industrial subsidies – some of the key issues that the United States has cited in its spiraling trade dispute with China. But there were several notable points of difference with Washington, with the leaders reaffirming support for the Iran nuclear deal and the Paris climate change agreement. The EU has taken a confident leadership position by signing this EPA with Japan, said Dr. Aukje van Loon, a research associate at the Chair of International Politics, Ruhr University Bochum in Germany. European officials say the deal will scrap Japanese duties on many cheeses such as Gouda and Cheddar (currently 29.8 percent) and on wine exports (currently an average of 15 percent) and open up markets in services, especially financial services, e-commerce, telecommunications and transport. According to a press briefing by Japan’s Ministry of Foreign Affairs, the EU will eliminate about 99 percent of customs duties while Japan will eliminate 94 percent of its duties. Japan’s agriculture, forestry, and fishery sector has received some special attention, with Tokyo managing to exclude rice from the tariff cuts. The setting aside of this area for further negotiations reflects one of the advantages of concluding bilateral free trade agreements where “the WTO single undertaking ‘nothing is agreed until everything is agreed’ does not hold,” concluded van Loon. Parsing the new EU-Japan strategic, economic and digital agreements.